Our writers don the hats of famous people and recommend the best places to binge at. The wretched life of a writer is solitary at heart, but it’s at least a heart that is well-traveled. And it was with a heavy one that I found myself deposited in the Eastern reaches of London. Since most cloudy days presuppose melancholia, I fruitlessly sought out remembrances of home on most mornings. Keeping this up, I squinted at skyscrapers for that telltale Empire line, even searching through a sea of faces for someone I recognised—a glimpse of Zelda, perhaps. And then, I hit on it. Pancakes: sweet comfort, and an irrefutable symbol of home. I set off with a spring in my step; positive my odyssey wouldn’t be in vain. Brunch (with licensed liquor, too). I know a hot spot when I see one. Happening upon The Book Club, I was drawn to it immediately. Feeling a little out of place among the cool customers wandering around the light open space, I entered into a dumbshow with someone I assumed to be the waiter; we shared a brief, odd look before I ordered at the liquor bar. The element of self-service continued with napkins and cutlery held in a container nearby. My pancakes arrived promptly, and were as light and fluffy as in childhood, even if a little chewy. Almost tooth-rottingly sweet, they were covered with blossom honey, a pecan-caramel sauce and berries. When through with the golden-brown moons of flour, I chased the residual nectar around my plate with a blueberry. The homesick pit in my stomach filled, I left the Book Club not sated with words, but a good breakfast and not quite managing to keep up my dining manners. Truly a la carte: out of a cart. The following day was a Sunday, a day of rest for most, but I’d heard about the famous Old Spitalfields market and set off in search of it. In due time, I came across Brick Lane just behind. Here resides little India; the sights and smells enchant at every turn. I found a Dutch pancake stall in an enclosed area filled with the smells of different cultures. Barely ten centimeters across, made in a special mould on a hob, they shaped and browned themselves within seconds. I was soon armed with ten of the bites, slathered in dark chocolate sauce, with sliced banana. Though not fluffy and reminiscent of home as the previous, they were a fresh, satisfying find—easy to enjoy in the happy chaos at this center of food production. A very American breakfast after a night of heavy drinking. My next foray called for a different institution. I made for the taller, more reflective buildings in my eyeline. Soon, I was in the City of London, which reminded me sharply of New York’s financial quarter. Wary of not becoming overwhelmed with the tide of buy-and-sell, I came to Smithfield Market, a location quieter than its more rowdy, Easterly sister (Spitalfields). Smiths of Smithfield was a warehouse-like affair. Even at an early hour, it was a hive of activity: music, conversation and sounds from a kitchen on the ground floor; not to mention the smell of hash brown and fried egg. The tables reflected a staunch diner theme, right down to a napkin dispenser and cutlery. I ordered the plain pancakes with syrup, and was rewarded by three thick, berry-infused discs and a chalice of maple extract. This smart cafe appealed to my inner food hound not just with flavour but also style. Sophisticates, meet here at seven sharp. 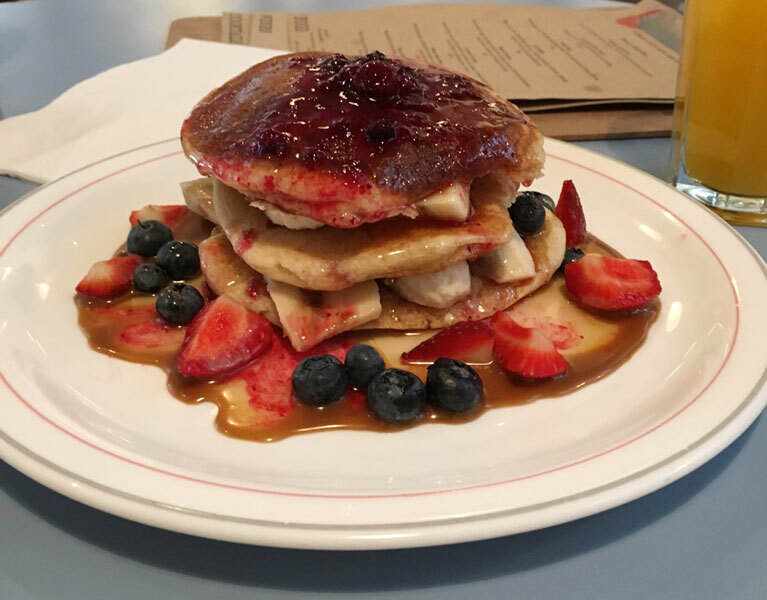 At Hoi Polloi, the restaurant attached to the upmarket Ace Hotel in Shoreditch, I ordered the strawberry pancakes with lemon thyme and sour cream. The three-tiered stack of griddle cakes—topped with a red sauce concoction—gleamed with promise. To American sensibilities, sour cream is nothing new, and to my mind, delicate British palettes have now joined ranks. It did its job well: cutting through the sweetness of the strawberry. The cakes themselves were light and golden. Chic, low-lit surroundings added to my dining experience, quite like at a plush restaurant in New York. The staff were pleasant; they smiled every time they passed my table and the sheepish expression I sported. Fine dining up where the air is clear. Though I had enjoyed the terrain well as an ant, I longed to enjoy a bird’s eye view to accompany my food. Keen to settle somewhere pleasant to peruse news from back home, I’d heard there was no better place than Shoreditch House, though the doors are open only to members. Fortunately, I was able to avail the privileges thanks to a friend who was kind enough to loan me entrance. Ensconced at the table, complete with the view I craved and plush surroundings that felt more at home than I cared to admit, I ordered (what else) pancakes with raspberries and lemon curd. They were the very spit of a childhood favourite, with curd that brazenly challenged my grandmother’s—and won. The staff moved swiftly through the tables, and in the time my happy fork was to return to the empty plate, the plate was gone. A fine, lavish establishment like most members clubs: nice work if you can get it. Old Spitalfields market, adjacent to Brick Lane’s Little India, is an east London landmark that stocks antiques, clothes and food from across the globe. Trains for both for the introvert and extravert: Underground at the large epicentre that is Liverpool Street station, and the Shoreditch High Street Overground. Dennis Severs' House in Folgate Street is a perfect replica of a traditional 17th century residence made up and kept in style. Many bars, bodegas, and pubs. Enough alcohol to atone for the American Prohibition.